90° angle can be challenging more often than not. A simple solution is to place a square in the corner of the two stock pieces you need to square and secure with a set of clamps, this however can be frustrating. Now with our Clamping squares, you can do just that without having to find a square thick enough to accept a standard clamp. The clamping squares are 3/4" thick to make clamping and placement a breeze. 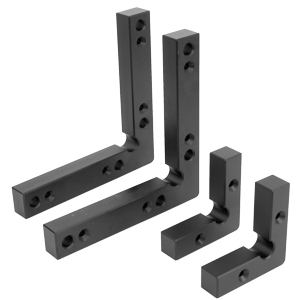 Each square is made from aluminum and machined with a tolerance of +/- .001. The squares have beveled edges and are anodized to resist staining. The squares are available in two sizes: 2-3/4" and 6" and come in packs of two.